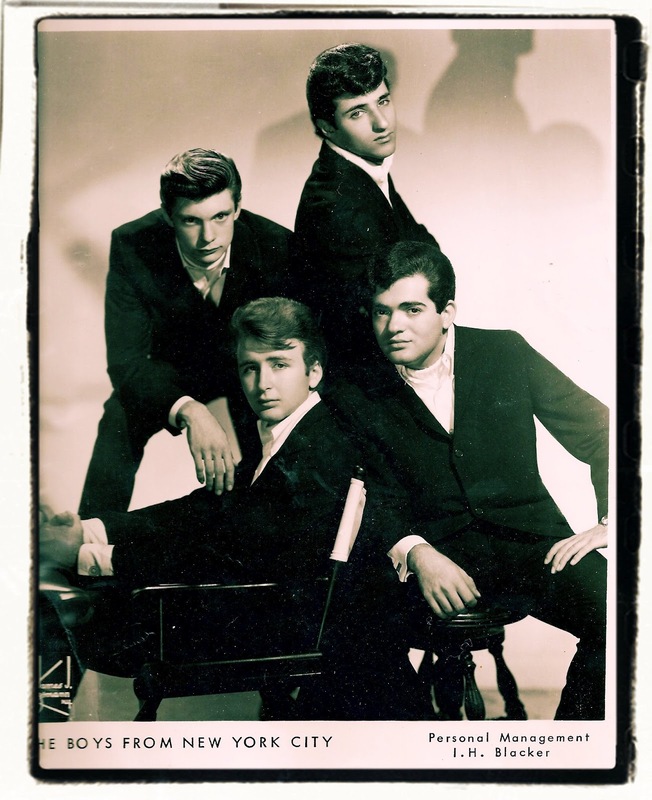 I've recently (indirectly) made contact with Don Sallah who may be best known for his 60s band The Boys From New York City. With the help of his daughter (thanks Danielle) I have pieced together his musical jigsaw which has taken in a variety of styles and fashions (just check out the pics that follow). 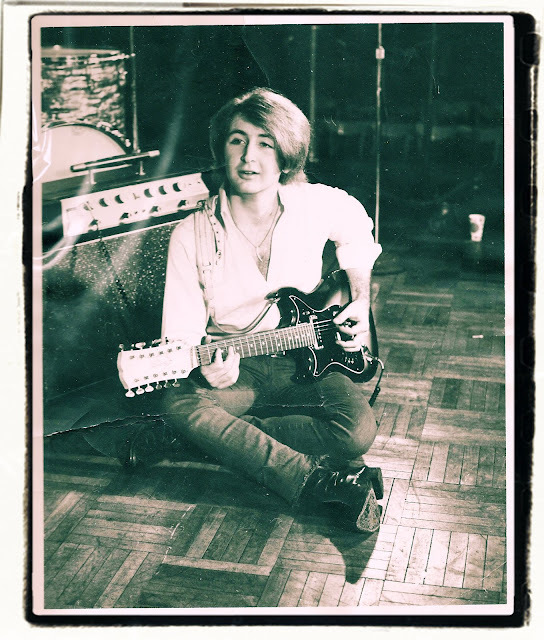 Don's first foray into the world of rock and roll was during the very early 60s when he put together his first band called Little Moose and The Hunters. (He was the little moose). The songs for the 45 were recorded at Gabriel Oller's recording studio in New York's Spanish Music Centre (hence the label SMC). The studio was situated on Sixth Avenue. Don mentions that he did an album of instrumentals under the name The Pioneers for SMC records and around the same time backed up Chuck Berry once at UPenn and played with a then unknown Billy Joel. 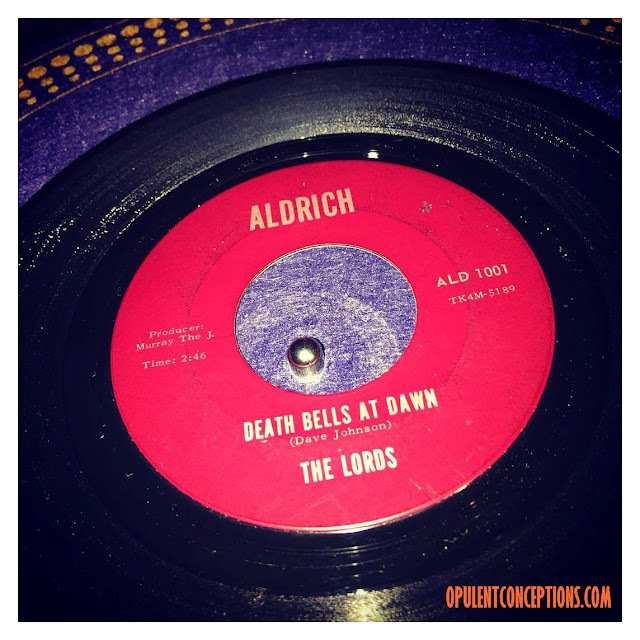 The next band Don Sallah put together was a vocal harmony group called The Emeralds. 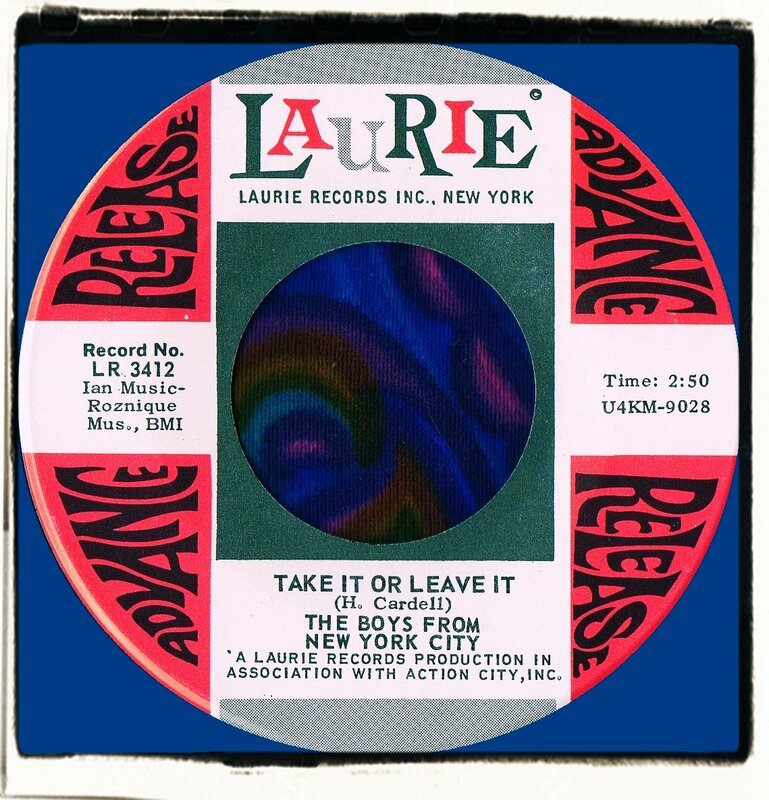 Although this band did not record any material they were a big draw on the local scene but Beatlemania was just around the corner and teens would want guitar bands and that exciting rhythm and beat. 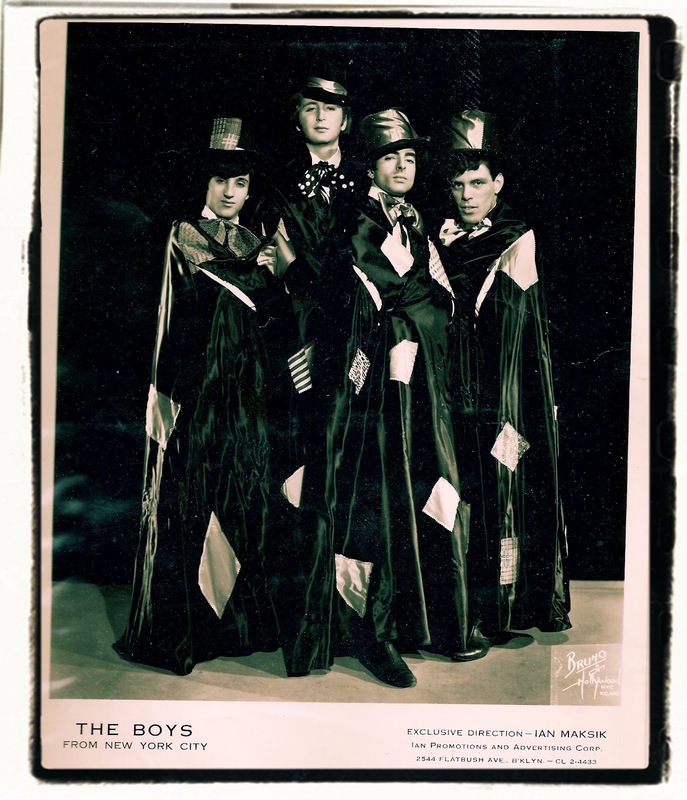 Here's a publicity shot of The Emeralds. The group were Don Sallah, Les Jansson, Tony Franquiero and Hank Cardello. 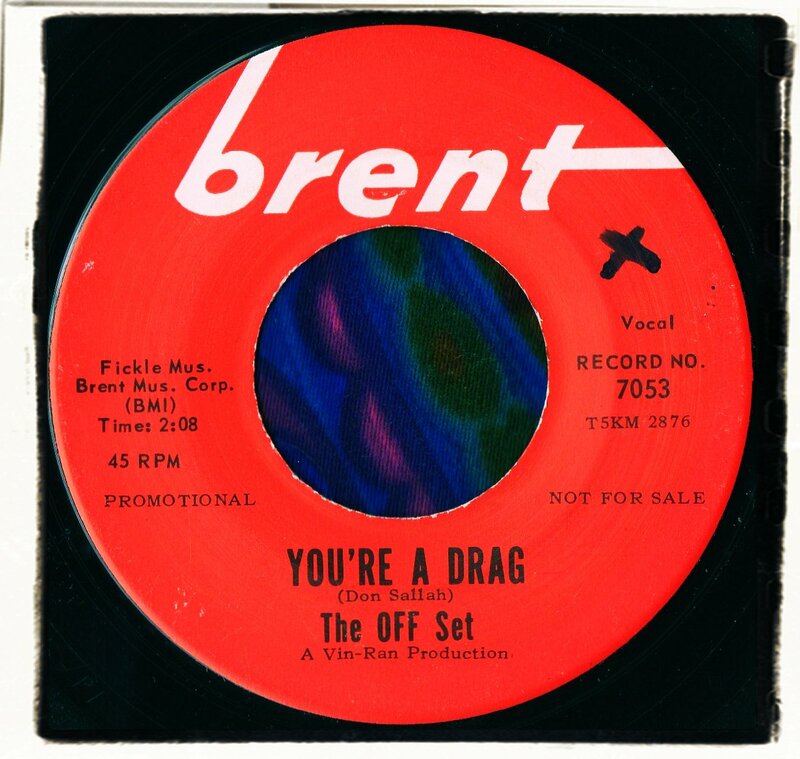 The next venture was a band called The Off Set who recorded for Brent Records. They were very much a studio based group with Don joining forces with Vinnie Testa and working again with ex Emeralds friend Hank Cardello. The first 45 was 'Just A Smile'/'Lonely Lonely Night'. 'Just A Smile' was written by Vinnie Testa with Don taking on lead vocals with back up vocals by Hank Cardello. The flip 'Lonely Lonely Night' was written by Don. He and Hank shared vocal duties. 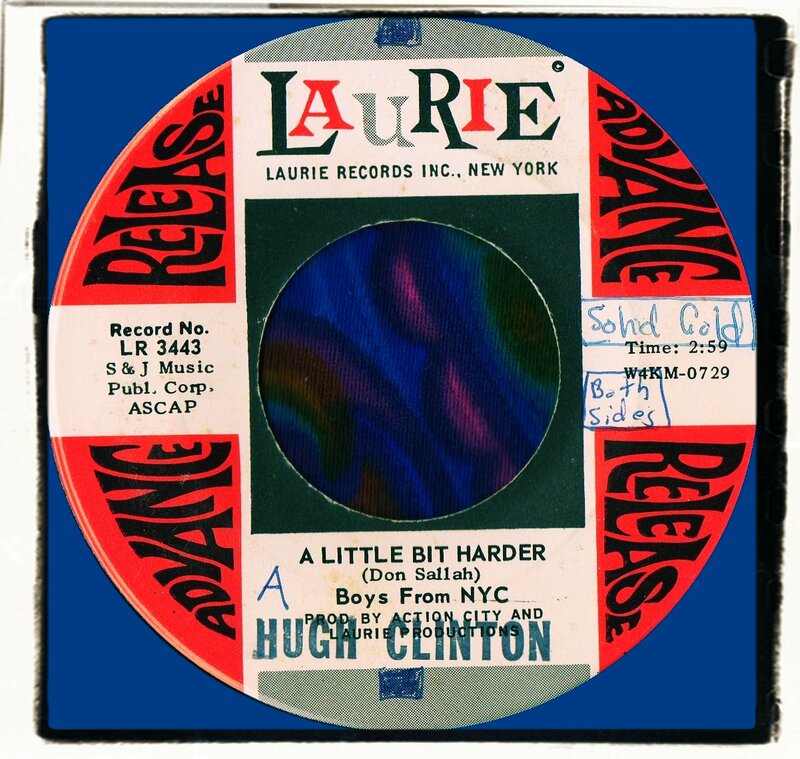 The follow up was a classic folk rocker called 'You're A Drag' b/w 'Little Girl, Little Boy'. The next band put together by Don was The Boys From New York City. 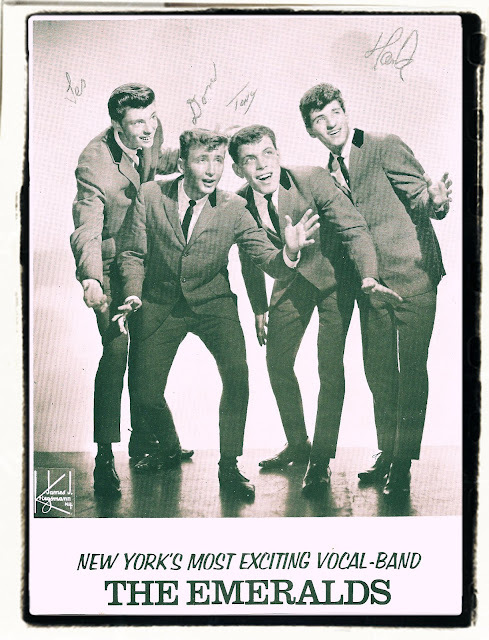 They would become a very popular group in the Big Apple supporting many of the major rock groups that toured NY. 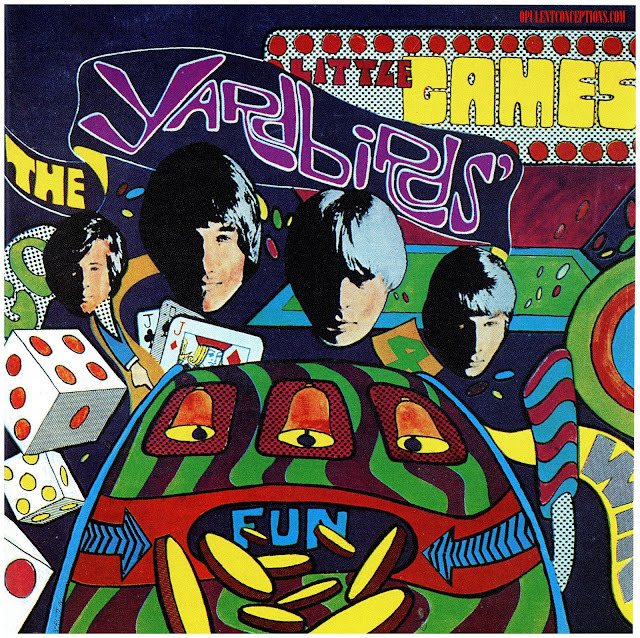 One time when The Boys From New York City opened for The Turtles at Worcester Memorial Stadium in '68 the fans rushed the stage and police had to contain the chaos. The BFNYC cut short their set and The Turtles refused to go on after them, giving up something like $5000. The debut Boys From New York City was the Dylanesque 'Take It Or Leave It' backed with a ballad. This one's got a real cool harmonica break and was commercial enough to warrant some chart action but I don't think it charted anywhere. 'I'm Down Girl' is a fast paced garage rocker notable for Hank Cardello's cool scattergun drum fills. This tune is real exciting and has a whole lot of buzz about it. No doubt about it this one's a scorcher. It almost sounds like a different band on the flip. 'Mary And John' is a piano & strings ballad. Don Sallah (vocals/guitar) Tony Franquiero (organ/sax) Ray Martinez (bass) Hank Cardello (drums and some vocals).....For a short time ex Emeralds member Les Jansson played bass. For whatever reason it was decided to release the next 45 as The Energy Package. I can understand in a way because both songs are trippy psychedelia and it would be better to have a more progressive band name to promote the record. I first heard 'This Is The Twelfth Night' way back in the 80s on a vinyl compilation called Psychedelic Unknowns - Volume 7 and it was one of those songs like kinda stuck in my mind for years. 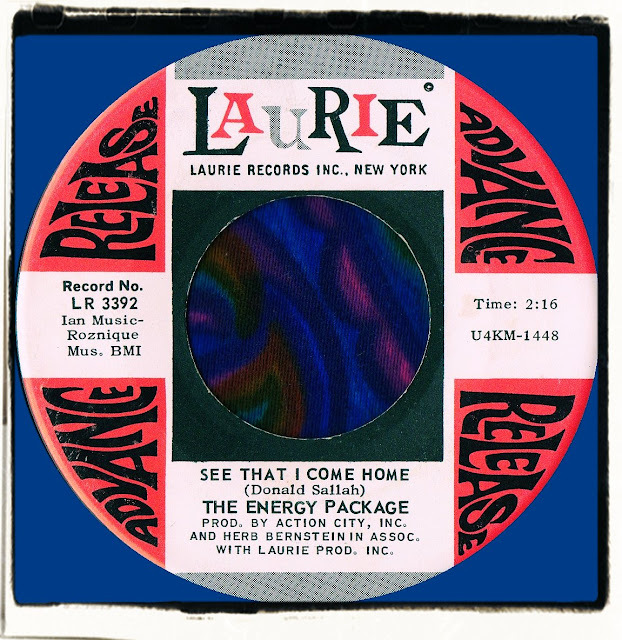 When I decided about 10 years ago to collect original 45s, The Energy Package was high on my list. Little did I know that I'd be receiving info and photographs from the songwriter 20 odd years later. But such is the beauty of the internet and the 'small' world we now all live in. 'See That I Come Home' is also a blast but much more melancholic and trippy. Having always been intrigued by 'Twelfth Night' I asked Don (via Danielle) about the song. Here's what he had to say about the recording. 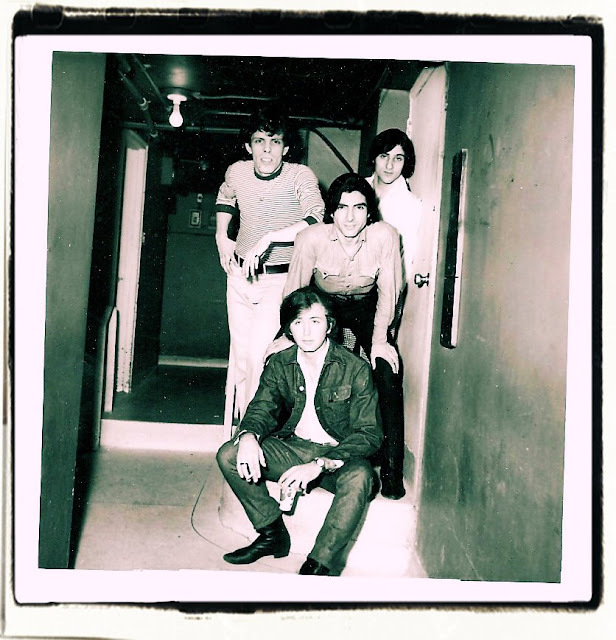 "The lyrics came from when I wrote poetry in my basement in the early 60s. I was an English major and wrote a lot of songs with a tag line from Shakespeare (none of the others were recorded). 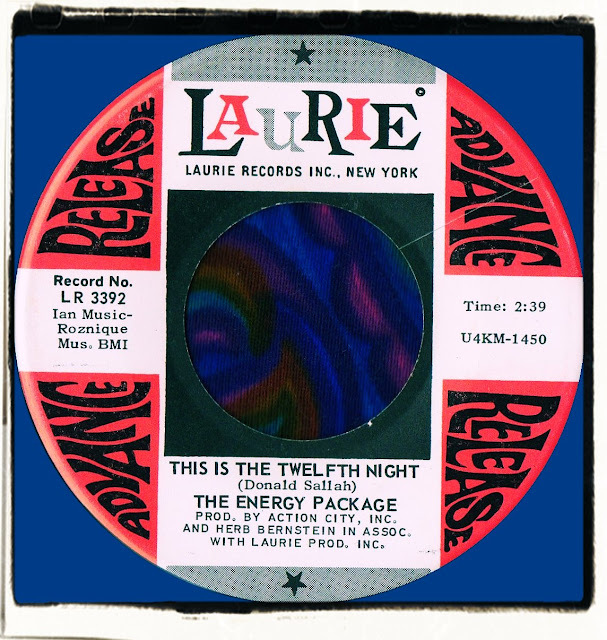 I set 'This Is The Twelfth Night' to music after listening to a band called The Music Machine at a gig in The Highway Inn in Roosevelt, Long Island. The Music Machine played a song called 'Hey Joe' which influenced the songs sound and structure. 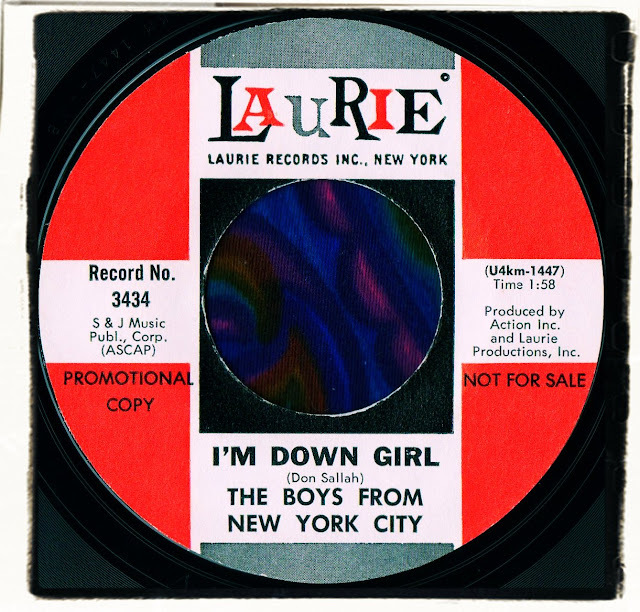 That and Phil Spector's wall of sound"
The final 45 on Laurie saw a slight change to their moniker to The Boys From NYC. For a year or more the Boys had raved as the house band at The Highway Inn but times were a changin' and Don was thinkin' about getting a 'proper' job and was interested in Law. Both sides of this disc are commercial bubblegum pop and if this wasn't gonna be a hit nothing would. Sadly no hit followed and law books would have to be studied. 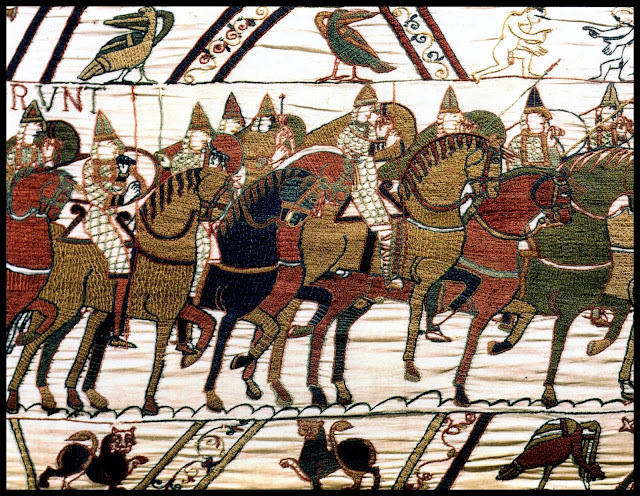 The band had gone as far as it could. 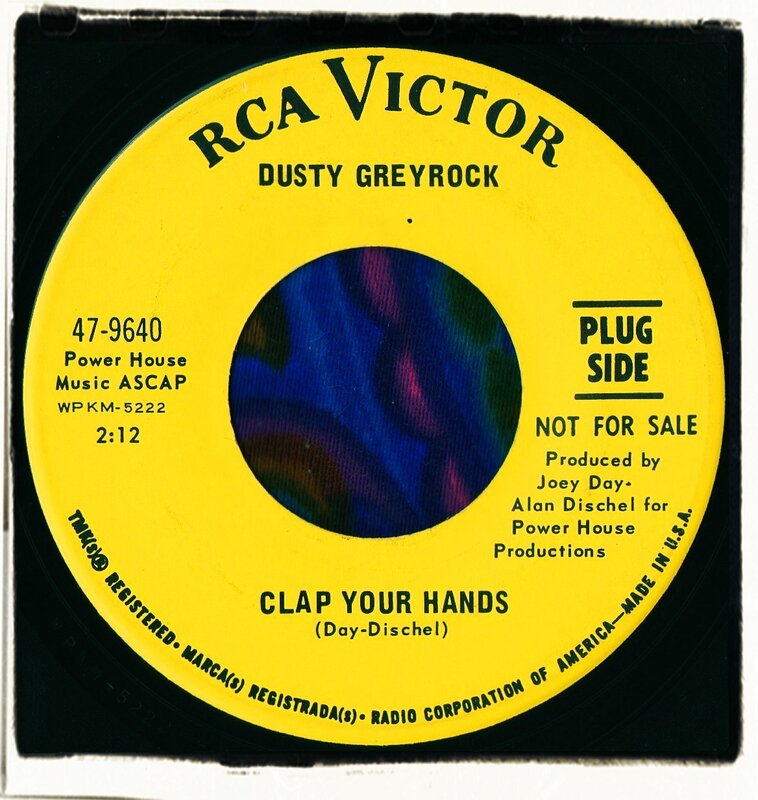 The final piece in the Don Sallah music jigsaw that started in the very early 60s with Little Moose And The Hunters ended with a solo on RCA Victor as Dusty Greyrock. 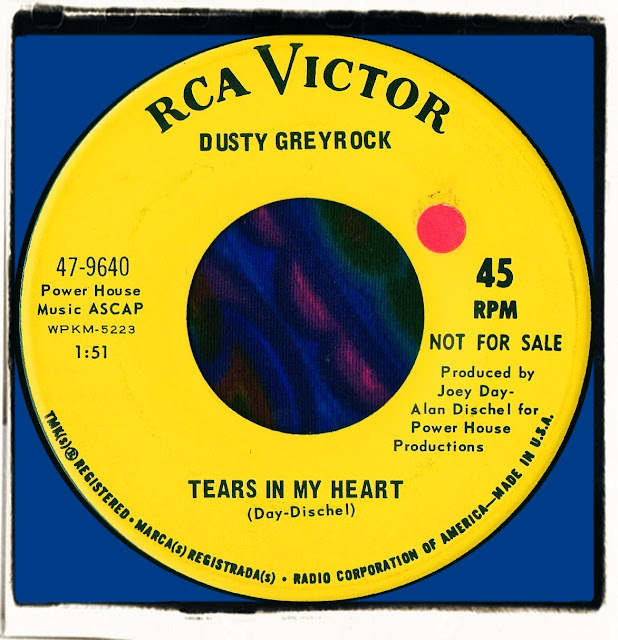 As with The Off Set, Dusty Greyrock was just a studio production and a favour to the Producer who needed someone to add vocals to the already recorded music. 'Tears In My Heart' has become a sought after Northern Soul favourite in Europe. 'Clap Your Hands' is yet another bubblegum mover. Both sides get the EXPO67 seal of approval. If I'm not mistaken, I saw the BFNYC open for the Lovin Spoonful in August '67 They were great! They did a smoking version of Gimme Some Lovin. At one point during the set they began fighting each other and at one point the keyboard player was sprawled, prone on the floor playing the organ. At 13, I thought they were coolest thing I'd ever seen! Where can I get a copy of " These are the things? There's a couple of 45's on SMC Pro-Art label from 1959 by a group named The Metropolitans. "D. Sallah" is the listed songwriter. So, where does these fit in the history? I didn't see a mention of The Metropolitans. a perfect means of writing? I have a presentation subsequent week, and I'm on the search for such information. Fastidious respond in return of this difficulty with firm arguments and telling all about that.